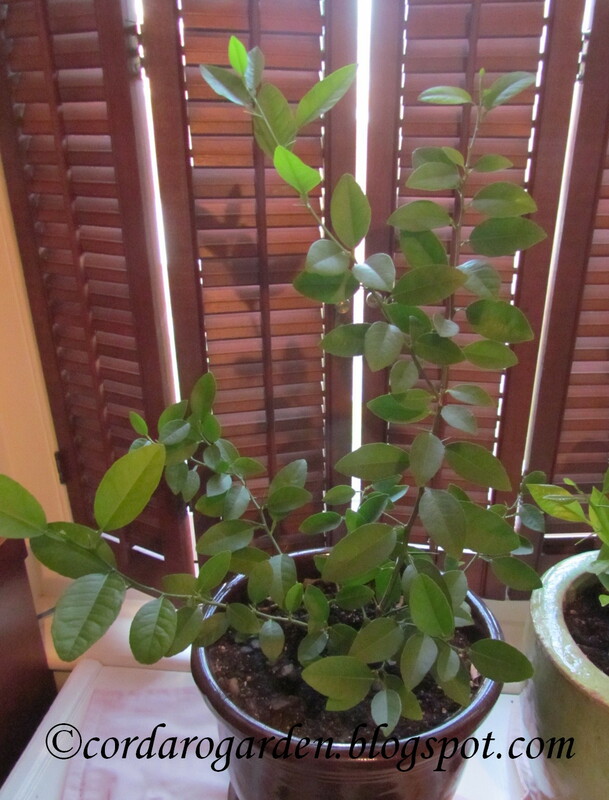 Last April I purchased 3 Dwarf Citrus trees. Which I posted about here. Boy these little guys are really doing well! They have spent the winter in "The Italian's" nice sunny office. It looks like we have a baby!! This is a cluster of 4 blossoms.....hopefully they will all produce little babies! There are also two other future blossom clusters on this little tree! The Dwarf Lime Tree is growing well....no blossoms yet. 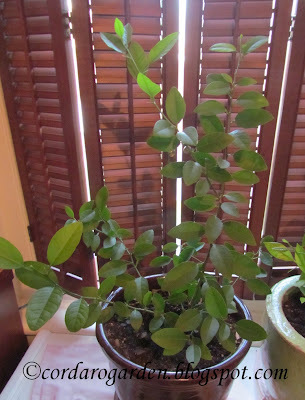 The Dwarf Orange Tree is also growing well.....no signs of blossoms here either. We are hoping that we will get some blossoms on the other trees this year too! I hope your citrus sets for you. I keep thinking about growing them, but I know I kill indoor plants. They do great then I get busy and forget to water them. I'm such a bad indoor caretaker. Weirdly I can grow transplants well, but real plants have problems. I need to start doing it though as the VOCs from our new house bother my lungs and plants would help a lot. Daphne, I'm not the best with house plants either. I do have at least 20 plants in the house though. I also have asthma and know that they are very healthy to have in the house. I try to keep really easy plants in the house. That way I won't kill as many. I've been very good about the citrus trees. I think it's because they are food!!! 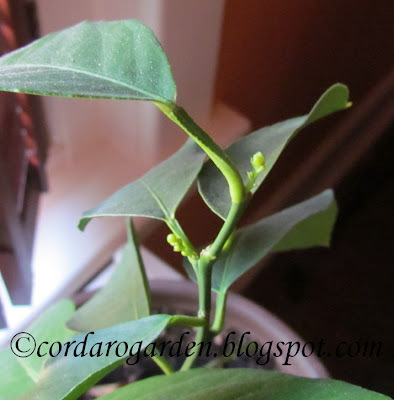 Yours are looking good and I take a peak at my meyer lemon almost everyday and the baby lemons still are all there, except for one that decided to drop off. I guess it wanted to try bungee jumping. Robin--when do you take your pots outside for the summer? 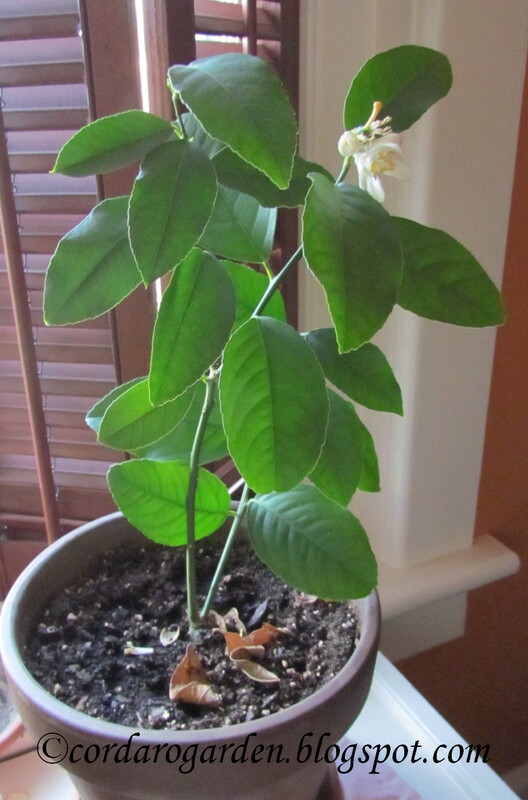 This is my first time ever growing citrus and it has been indoors since receiving it in February. 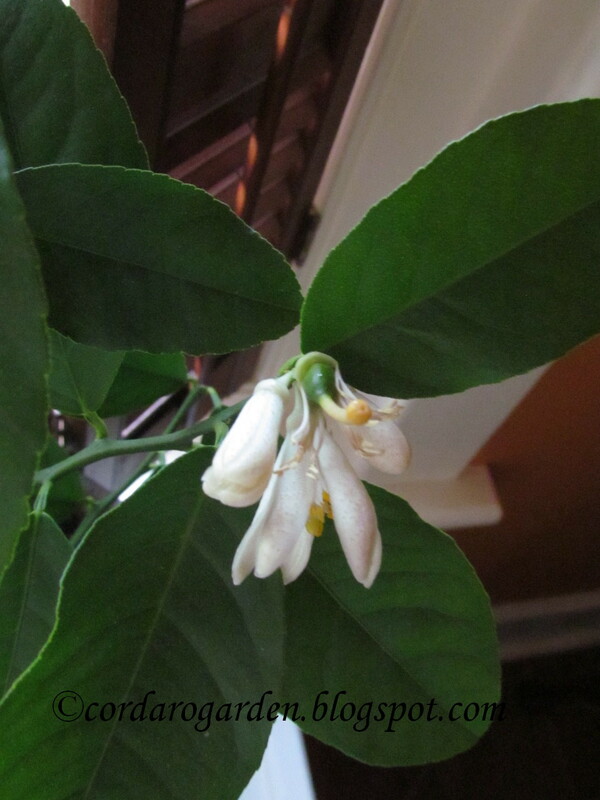 I won't take the citrus trees and bay laurel tree outside until May. 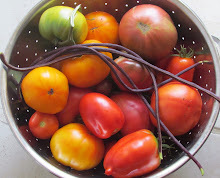 They need really nice warm weather just like tomatoes and peppers. I sure hope that my little lemon doesn't want to try bungee jumping! Awww, I miss my little Leona the Meyer Lemon Tree! I babied her for such a long time, and she had her first two lemons nearing ripening, when she was left in AZ for the new property owner. I wonder how she made it through the winter, and if her fruits ever ripened. Granny, I didn't know that you left Leona behind! I think that you should get another one! Yes, unfortunately there just wan't room for her. We sold all the furnishings to the new owner, and left a lot of stuff. Otherwise we would have had to rent a U-Haul. The way it worked out, we jammed everything into the back of the pickup, which made it an easy move. I am actually getting some lemons the size of my thumb nail. I am so happy I did not kill my Meyer lemon yet ;). I cant wait to see how your oranges turn out. It would be so exciting to get fruit on all these little trees! I've got about 6 dwarf citrus tress in pots outside. i've had them for a couple of years, they didn't set fruit last year but the meyer lemon, orange and tahitian lime have set fruit this year. I'm still waiting on some on the mandarin, kumquat and kaffir lime. The Kaffir lime is flowering at the moment. I love my citrus pots. 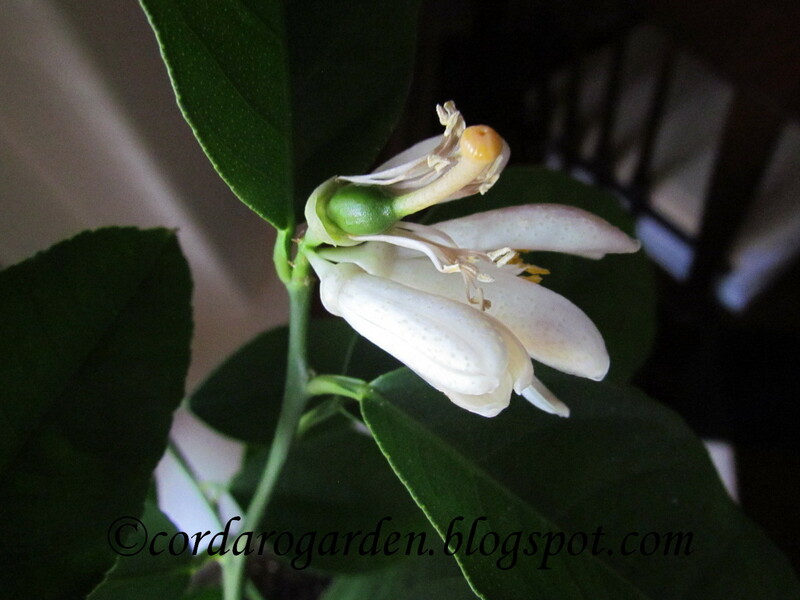 These little citrus trees are definitely fun! I so hope that I all of my trees produce sooner or later. I have yet to venture into growing dwarf citrus but I must say they are such appealing plants it is hard to resist them. Love your new banner pic - you used to try and tell me that you could not grow spinach. Pppffft! 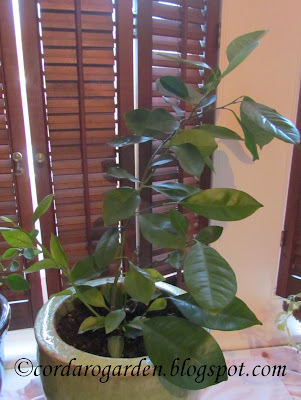 I think that you should treat yourself to a little citrus tree or two. 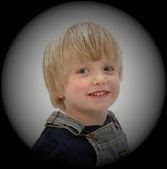 I figured you would see that pic and realize what I got a good harvest of this week. First real harvest of spinach since 2010! Robin- Your dwarf Citrus are looking really good. I had no dea that you could successfully grown them indoors. And I love the new banner. Your spinach looks great! I must get some planted - as soon as all of the snow melts! 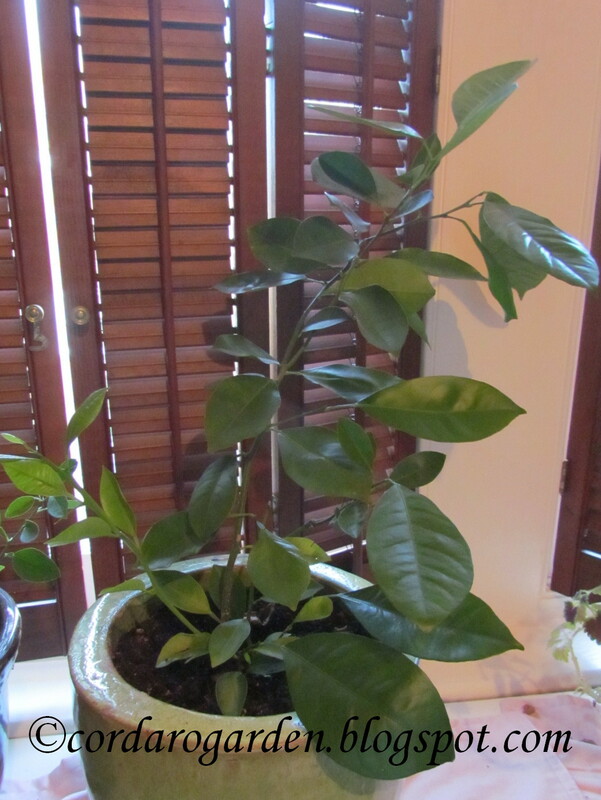 We are hoping for success with our dwarf citrus trees. It's such fun to grow something different!